The 1,2-alkyl shift can occur during the substitution reactions if an unstable carbocation is formed adjacent to a quaternary carbon. 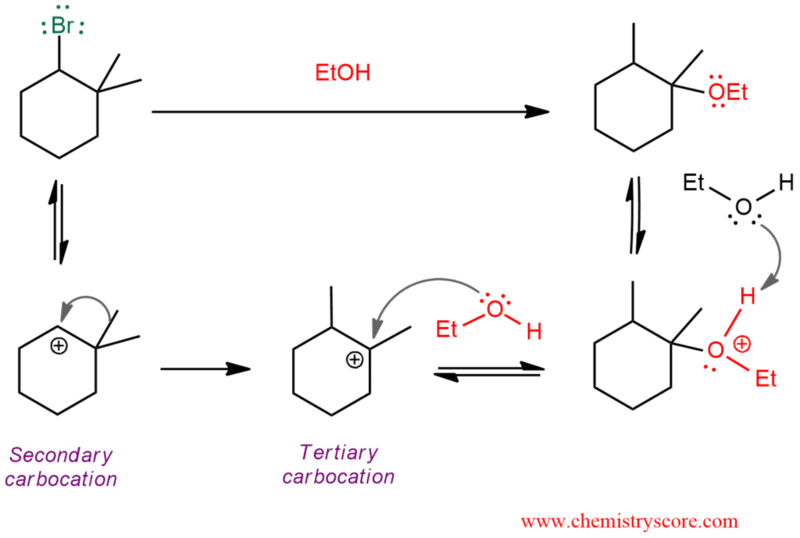 We have already talked about rearrangements, but with alkenes (Rearrangement [alkyl shift]). And all of this can be applied to alkyl halides in SN1 reactions. The same rule applies: if a carbocation can be achieved a more stable form it will do so. 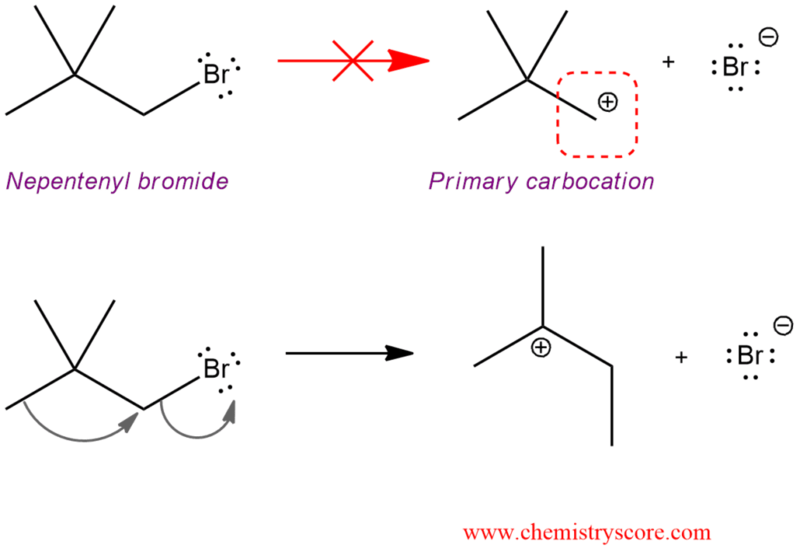 The reactivity of carbocations goes from tertiary to secondary to primary (primary alkyl halides usually do not occur in reactions). In SN1 reactions we usually have secondary or tertiary alkyl halides which can give a secondary or tertiary carbocation. If we have secondary carbocation which has quaternary carbon in adjacent to positively charged carbon there will always be a rearrangement. The tertiary carbocation is lower in energy than the secondary carbocation. But we must consider whether any of the other three possible steps will occur. In the following example, we have alkyl halide with a good leaving group which means that the mechanism will not begin with a proton transfer. This will be the last step of the mechanism. And the order will be as follows: loss of a leaving group, carbocation rearrangement, nucleophilic attack, and proton transfer (deprotonation). In the next example, we will see a rare case where loss of the leaving group occurs simultaneously with a carbocation rearrangement. There are alkyl halides which cannot lose its leaving group because that would generate a primary carbocation. And for this process is needed too high energy to form that carbocation.